Playing with stories enable children to internalize certain values that the mainstream teaching processes are unable to provide. 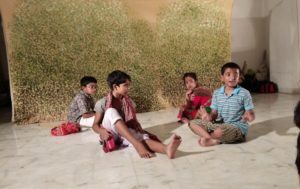 ‘Galpomancha’ and several other similar-minded groups attempt to provide children in Kolkata with a space that is neither about textbooks, nor electronic gadgets, but precisely about just that… playing with stories. How often we have heard it said (or perhaps said ourselves) that we want our children to grow up with the ‘right values’? If only we could instill ‘right values’ in the next generation, there would be less violence in the name of gender, religion, caste and class, the environment would be less polluted and the world would be a better place. One can of course debate what these ‘right values’ are, but if we broadly agree that these are something along the lines of honesty, integrity, compassion, peace, justice, freedom, respect for self, others and nature, the next question that arises is – where will these ‘right values’ come from? The obvious answer would be school. But can we really expect school to impart these values? In a system where seats are limited and candidates many, where the top few prevail and the rest fail, what children learn, above all else, is individualism and competition. Barring a handful of exceptions, the ‘good’ students learn to succeed at any cost and the ‘poor’ students learn to feel inferior. What about home, then? Maybe home can teach these values? We need not look very far in order to figure out how most children spend a majority of their time at home – staring at the screen. Be it television, smartphones, I-Pads or video games. There are about two dozen ‘children’s channels’ on Indian television today. According to a latest report released by the Broadcast Audience Research Council (BARC), children in India contribute 20 per cent share of eyeballs in the overall television viewership, the highest across all age cuts. Junk food, instant noodles, ‘health’ drink and candy companies are teaching us to be selfish and greedy, and making a grand profit in the bargain. The message is clear – you are what you shop for. This is where ‘Galpomancha’ comes in. Providing children with a space that is neither about textbooks nor about electronic gadgets, but about poetry, stories, films and plays. About tales of different writers, tales of different cultures, and the wisdom that they contain. About playing with stories. 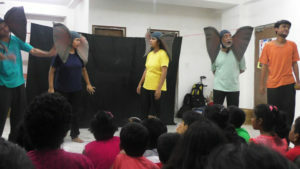 ‘Galpomancha’ – a storytelling space for children in Kolkata, hosted their fourth event of the year on Saturday 30th June. The previous three Galpomancha events had seen poetry, stories, and film as the storytelling forms; this time, the chosen medium was theatre. 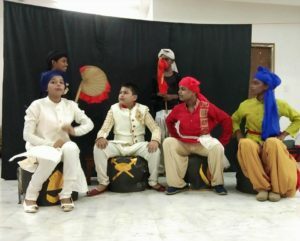 The evening comprised Sunli Jana’s ‘Aajob Natok’ by Onno Rokom, Galpomancha’s own production based on Leela Majumdar’s ‘Aandhar Moni’ and ‘Ta She Jotoi Choto Hok’ by Jhalapala, based on Dr Seuss’s ‘Horton Hears a Who!’, in addition to some songs and poems by the children and adults present. The first two plays were performed by children while the third was performed by adults, for children. One could get into the merits and demerits of the performances that took place, but to do so would be missing the entire point of the initiative. What mattered, the way I see it, were the values I saw reflected that evening, and that is what I would like to share here. There was, of course, the wisdom contained in the stories themselves. ‘Aajob Natok’ humourously depicted the farce of the ruling class, and how the common man is the true hero of society, a simple truth that adults need many manifestos to understand yet still have not grasped! ‘Aandharmoni’, using music, movement and masks to great effect, illustrated the power of lighting a candle rather than cursing (or fearing) the darkness. And ‘Ta She Jotoi Chhoto Hok’ served as a very important reminder in these times not to ignore what we cannot immediately see, to consider the impact of our choices on smaller, marginalized, often voiceless, creatures and people. Being a theatre practitioner myself, I must confess my partiality to the form. It is hard to imagine any other medium that can convey so many invaluable life lessons in so simple and captivating a manner. These lessons need not be taught, as in a ‘Moral Science’ class, but surreptitiously make their way into young minds. And as for the child actors, who explore a play with their thoughts, words and bodies day in and day out during rehearsals, these values just become a part of who they are. But perhaps the even greater reward of working on a play together are the bonds that get created amongst the team members, and the values of discipline, teamwork and responsibility that the theatre process naturally entails. Galpomancha facilitators shared how a strong community emerged in the one month of theatre workshops preceding the show, and that, I believe, matters even more than the final performance. In a time when children are not far behind adults in falling prey to loneliness and depression (remember Blue Whale Challenge? ), theatre could be just what the doctor ordered. 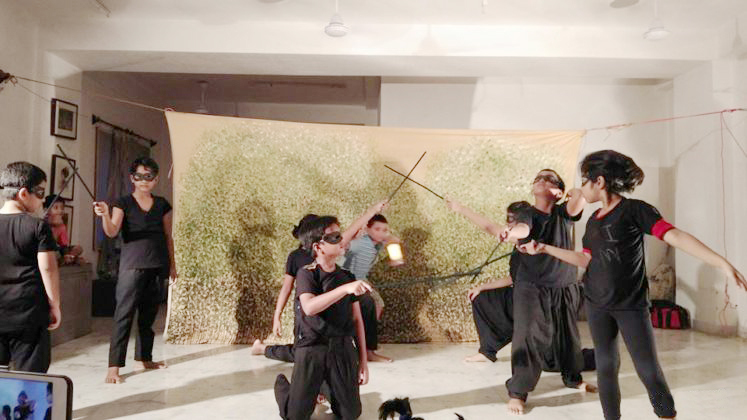 We at Swabhav Natak Dal – the theatre collective I am part of – have long realized the power of children’s theatre, whether it is plays by children, plays for children, or both. Two years ago, we travelled across Bangla-medium schools, learning centres, slums and villages in seven districts of West Bengal, with ‘Haat Ghoralei Golpo’ – a play for children, performed by adults. The play comprised a couple of folktales that we adapted, and several songs. Within these two tales were hidden many smaller ones – the tale of trees, the tale of water, the tale of farming, and the tale of the damage modern civilization is inflicting on nature. The idea was to share the wisdom contained in folktales of different cultures with the next generation, connecting it with the social and environmental realities of our time, and through the medium of live performance. 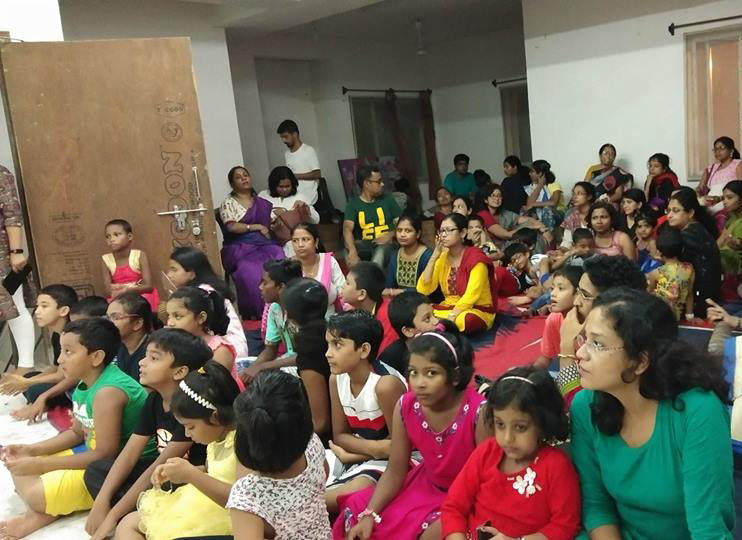 Galpomancha, Onno Rokom, Jhalapala, Swabhav Natak Dal and several other small initiatives are trying to create alternative spaces for children, spaces that are neither home nor school. Spaces that allow them to be creative, allow them to be in community, allow them to realize their own worth. But these spaces are still few and far between. We need more such spaces, more time that children spend in these spaces, in order to pose a legitimate challenge to tuition classes and television channels, I-Phone and McDonald’s. So that we can move from ‘I’ to ‘us’, so that our children can grow up with the ‘right values’. 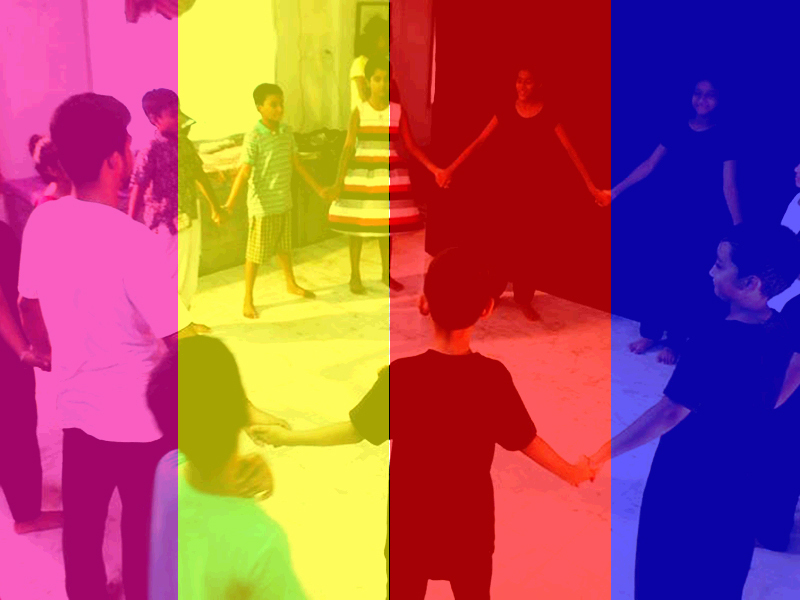 Vartika is a theatre activist who loves working with children.